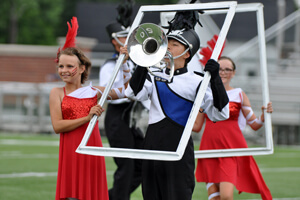 Drum Corps International's World Championships week got underway, Monday, Aug. 5, as 14 Open Class corps came together at Ames Field in Michigan City, Ind. for the first of two days of competition. In an upset from previous Open Class competitions, Vanguard Cadets (1st, 94.35) edged their way into the top spot, besting Blue Devils B (2nd, 94.10) for the very first time this season, by a quarter of a point. "Tonight was a reflection of the last couple days where they really, really worked hard," Vanguard Cadets Director Steve Barnhill said. "The corps' effort has been absolutely stellar. I watch things and they just seem to be another notch faster. The marching is that much cleaner and the horn line is that much louder. It's exhilarating." 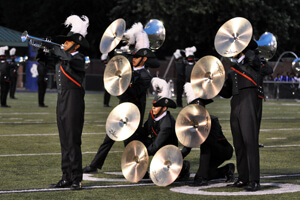 Vanguard Cadets Drum Major Carl Huang said that the real highlights of his corps' show, "The Art of War," are the music's dramatic moments and drill formations that the members love executing. "I haven't felt anything like this since last year at the Open Class Finals," Huang said. "Tomorrow we're looking forward to being better than ourselves. As I've told the members, there's a straight line path for us to first, all that can keep us from it is ourselves." While Vanguard Cadets took first in brass and color guard, Blue Devils B took first in percussion, as they aim to win the Open Class percussion caption award for the fifth year running. "The drum solo is very energetic, and you can see that energy from everybody as they perform," Blue Devils B Drum Major Niko Martinez said. "As a corps, we still have some work to do. We're not going to let up until the cutoff of the last chord. We're very strong, but we can be even stronger." Rio Grande Valley's Genesis finished third (91.20), followed by Music City (4th, 89.65), with its production "Postcards from Havana." 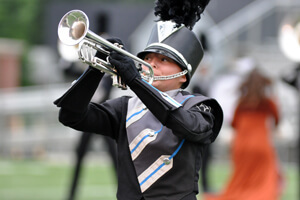 Third-year Music City trumpet player Daniel Krenz said the corps is working to have another solid performance at Open Class Finals Tuesday night. "Since it's a jazz show, it's really nice to be a trumpet player in the corps," Krenz said. "I really love the music, and I think the fans do, too." 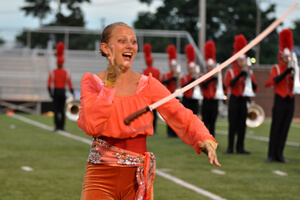 Spartans (5th, 89.40) rounded out the top five of the night, trailed by 7th Regiment (6th, 86.45) and Gold (7th, 86.10). Though based in San Diego, Calif., Gold included 12 martial artists from the largest martial arts school in the World, Laizhou Zhong Hua, located in Laizhou Shandong Province, in the corps' production "East Meets West." "At first it was really nerve-wracking because we couldn't speak their language," Gold Drum Major Joselyne Grace said about the martial artists, who arrived to work with the corps in person about one month ago. "Through music, we broke through the language barrier and were able to communicate with them." Legends' (8th, 84.10) production "Ichabod" tells the classic story of "The Legend of Sleepy Hollow," complete with a crowd-pleasing finish depicting the headless horseman's murder of Ichabod on a bridge set on the 50-yard line. According to Legends front ensemble member Nicole Atkinson, "We did everything we needed to do and put on a great show today. We'll think of tomorrow as just another run-through, because every time we perform, it's a chance to win over the crowd." Raiders (9th, 83.30) and Colt Cadets (10th, 78.85) wrapped up the top 10, and in 11th, performing its production "Butterfly Lovers," finished International Class corps Taipei Yuehfu (76.85), from Taipei City, Taiwan. "I hope the audience will understand the story we're performing," Taipei Yuefu trumpet player Claire Peng said. "It's just like Romeo and Juliet. The two protagonists love each other, but the society and the pair's parents forbid their love. They cannot be together in life, but they die and become butterflies, allowing them to be together forever." 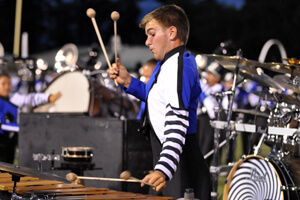 Blue Saints (14th, 67.55), Racine Scouts (13th, 67.75) and Les Stentors (12th, 74.70) will be the first three corps to perform at Open Class World Championship Finals in Michigan City on Tuesday evening.